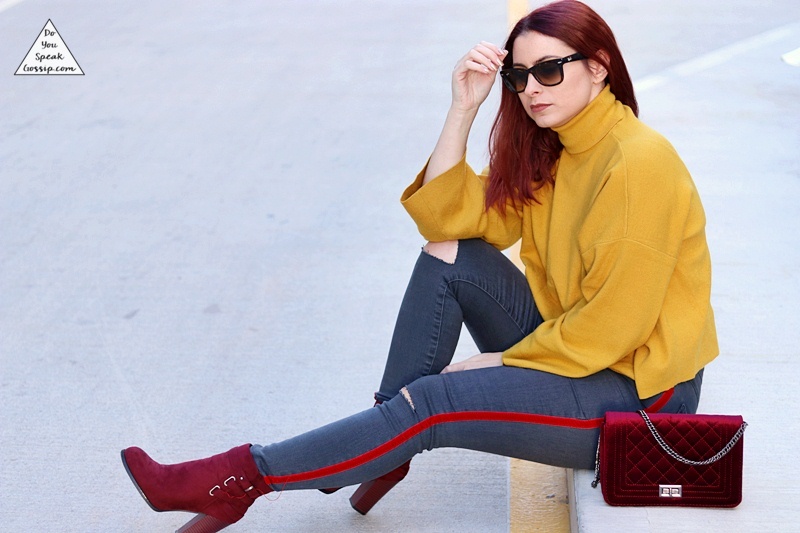 mustard sweater Archives - Do You Speak Gossip?Do You Speak Gossip? As you might already know, mustard is a huge color trend for fall/winter 2017/2018. Even though I didn’t really like it in the past, it works well with my skin tone and hair color, so I decided to buy a sweater in this color, after having seen it online and loved it. This is an oversized sweater, and it’s a bit tricky to buy the right size online. I actually for the first time in years, had to return it and size way down with this one. I actually got it on XS, and as you can see it’s still quite oversized on me. I couldn’t wait to wear it of course, and even though it’s still not cold enough for turtlenecks, I went along and wore it anyway. I paired it with my leather like pants, that still fit well, even though I gained weight since last winter, and my favorite winter booties. Simple but great at the same time. What do you guys think?